I have minecraft installed on Ubuntu 14.04 LTS. For some reason multiplayer doesn't work for me: I get a good ping for the server but every time I attempt to join, for the first few moments everything works and chat is working but then, all the players freeze, chat doesn't work, portals don't work, and when I type something in chat, it doesn't show up. After 5 more seconds, I get kicked from the server and it says "Connection lost Timed Out". I've tried joining many servers (hypixel, mineplex, etc.) but none of them work (the same thing happens to all of them). I've tried restarting my computer 2 times, disconnecting and reconnecting my wifi, and I re-installed minecraft. "After 5 more seconds, I get kicked from the server and it says 'Connection lost Timed Out'." That's the problem, it sounds like your ping is dying when you join the server, try joining a much smaller server (like 5 players on it), make sure your ping is under 100 (150-ish is fine) and see if you can play. Your connection to your router - Try playing on an LAN world hosted on a family member's or friend's computer, if this does not work, you may need to contact you internet provider or router vendor for a replacement router. If you've timed out, it might be because your memory allocated for Minecraft has filled up. Minecraft Launcher: Since Minecraft version 1.6.X you can use the new launcher. With this, it is possible to integrate Java commands directly into the game. 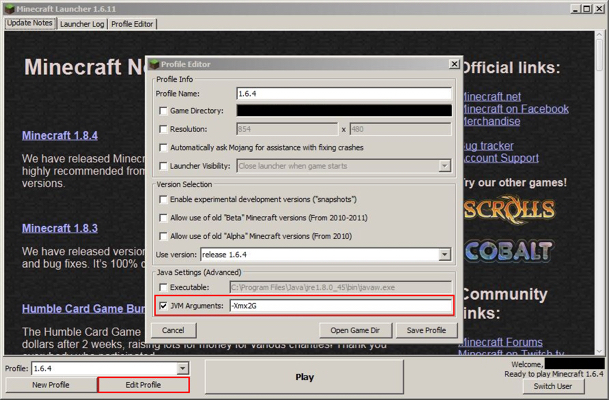 Here is what you have to do: Download and execute the new launcher In the section "Profile Selection" click on "Edit Profile" Under "Java Settings (Advanced), activate "JVM Arguments" and add into the text area this argument: -Xmx2048M -Xms2048M Save this profile and execute Minecraft. You will always start with 2GB of RAM. 2048M can be replaced with 2G, to make things simpler. You can also change the number to be bigger or smaller as needed. My brother and I are unable to connect to minecraft LAN servers, any way we can fix this? How can you join the survival server on Mineplex? Does Mojang occasionally invalidate all current game sessions? Should I install the Intel Drivers for Linux to make Minecraft faster? Why am I suffering extreme lag on any multiplayer server in Minecraft?